Experimenting with photography! What were you thinking? I've started to play around a bit with light painting and night photography. Here is one of my recent fledgling natural light painting attempts done at the falls on Difficult Run, which is on the border of Great Falls National Park. I know I have much to learn about this type of photography and I'll need to do a lot more experimenting with technique. I just keep wishing my health and schedule would allow me more time to get out there. I'm really looking forward to the flexibility of summer (and hopefully an improvement in energy levels as well)! The image was exposed at ISO 400 and f/18. 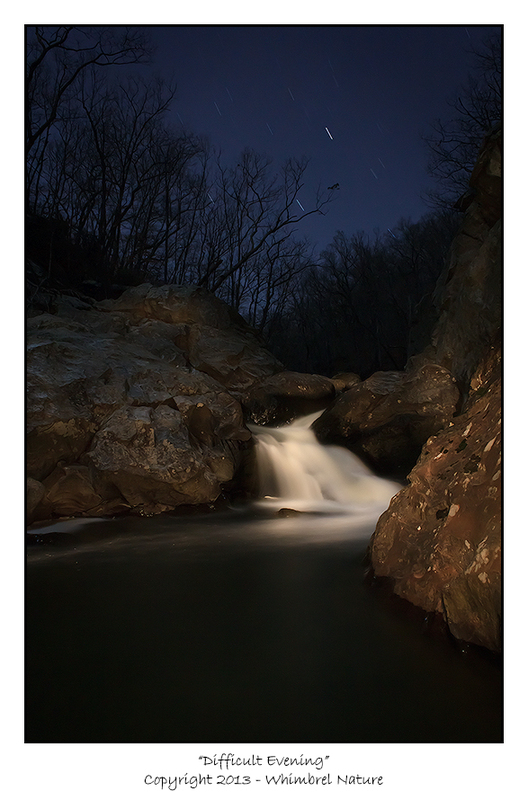 I left the shutter open on "Bulb" for 350 seconds while I painted rocks, falls, and foreground water with a Rayovac 75 lumen latern. In retrospect, I realize I should have done shorter exposures and lit limited sections of the scene and then used "Lighten" mode in Photoshop to blend them together, because the noise from this long an exposure was really difficult to deal with, without getting significant artifacts and/or losing significant detail in the rocks. I have to admit that the field work was an awful lot of fun though! Look for more light painting and night photography coming soon. I love this image Elijah!